Thank you for showing interests in Train Smooth and wanting to work with me. So I don’t waste any of your time, I will be very upfront. Train Smooth was started in 2014 as just a coaching business. Within one week of starting I had ten athletes start working with me. Within two months I had twenty athletes work with me. Only now I have reduced this number to twelve athletes and it has never gone under this number. It really has only been since October 2017 that I want to move Train Smooth from a normal triathlon coaching brand to something bigger and better within the triathlon community. I started my daily podcast called Train Smooth. This started off three shows a week and is now seven to eight new shows each week that is featured on all good podcast platform and YouTube. It has only been since April 2018 that I have started to market Train Smooth content towards my current sponsors like 17 Hours with product placements and mentioned. There is a lot of work I am currently doing to make this a better process that all parties will benefit from. I look at Train Smooth as a marathon and not a sprint. I am looking twenty years down the road. 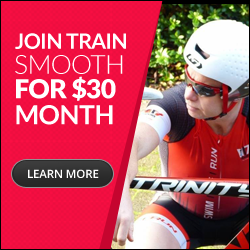 I want to build Train Smooth into a “go to” place within triathlon. I don’t do sponsor adds on the podcast. I find them tacky and often people press the forward 30sec button. I do however think this is a great platform for product placements. Each show has a photo that helps promote the episode and this is distributed through all social media platforms including the podcast playing platforms like iTunes. I produce a new podcast everyday. People send through their training, racing and nutrition questions and I answer these questions. Each episode normally lasts between 5-10 minutes in length. This is a very new platform I have started using. I video record my podcast and upload it to YouTube each day. Due to how new this is, there is currently little value I can offer brands and sponsors however as this medium grows in years to come, there could be amazing opportunities from a branding point of view. The way I record these shows will also change as the show progresses. I aim to create a new blog each week that is training, racing, nutrition related. The opportunities here from a branding point of view comes from product placement within the blog photo/other content that also is distributed through the normal social media channels. Publishing triathlon related news on the Train Smooth website is again something very new. Posting pro start lists, race results and any factual news, I am finding keeps a steady amount of new traffic coming to the site. I feel that this side of Train Smooth could develop into something great for the sport of triathlon and the brands I work with. If you think Train Smooth can help your brand and also provide value to my community, please email me tim@trainsmooth.com and we can talk strategies.